Gone are the days when there was a need to provision raw storage inside the server for “fast” data access. Today, there are so many cloud storage options competing for your data, and you can mix and match storage across the different providers. Serverless apps can run Lambda functions drawn from an Amazon S3 bucket, convert a legacy OS from an Azure Blob into a cloud server, mount volumes from Amazon EBS and Amazon EFS via NFS or use Azure File Storage via SMB, which every Windows PC user loves. In this article we’ll give you a side by side comparison of AWS vs. Azure storage services, and show you how NetApp’s Cloud Volumes ONTAP (formerly ONTAP Cloud) can work to enhance your storage options using either public cloud service. In startup culture, there’s little hesitation before reaching straight for the cloud to cover all storage needs. Startups don’t even think about purchasing massive onsite network attached storage (NAS). They prefer not to invest in infrastructure: WiFi and an electrical socket at a shared working space is all the infrastructure they need (plus a laptop!). As startups grow, they can benefit from the collective storage wisdom available in the cloud by using systems such as cloud-based Network Attached Storage (NAS), saving them development time and offering high availability. Flexible startups build their applications in microservices that talk to each other. Each microservice uses its own ideal solution. Some of these require fast, cheap, and flexible NoSQL databases stored by either Azure or AWS, while images are stored on Amazon S3 or Azure Blob. In order to be safe, a startup might store the backups in a compressed format in Amazon S3 for a month, then archive it in cold storage such as Amazon Glacier or Azure cool storage. During the development stage, they keep the NoSQL DB on their Amazon EBS or Azure Virtual Disk. When they go live, this is shifted to high-availability cloud databases that are regularly backed up and patched by AWS or Azure. How about more established small or large enterprises? They’re also moving their data to the cloud. Old on-site NAS systems are too clunky and expensive to be upgraded, and with pay-as-you-go billing, enterprises can benefit from a reduced IT budget that comes from moving to the cloud. They no longer need to purchase the storage they think they’ll need for the next few years since with the cloud they can grow as they go. Enterprises usually need a hybrid solution to combine their legacy NAS and local block storage systems with their new cloud storage needs. Great hybrid solutions are available that give control over all their legacy storage in the same window in which they control their highly available distributed data on AWS and Azure. For hybrid and multicloud environments, NetApp’s Cloud Volumes ONTAP (formerly ONTAP Cloud) can be used to manage storage that ranges between different locations, and supports NAS in both NFS and CIFS formats. Block storage divides your files into equally-sized pieces. This allows users to change just a small piece of the data, and do so quickly. The blocks are always connected to a cloud server, such as Azure VM or Amazon EC2. They store the OS to boot up the virtual server. Now for the AWS-Azure comparison of services: Amazon EBS stands for Elastic Block Storage: the basic storage devices for Amazon EC2. Azure Virtual Disks that connect to Azure Virtual Machines also use a block storage device. The entire server image is stored in a block device. Cloud block storage comes as traditional magnetic hard drive disks or with fast Solid State Drive (SSD). An SSD is much faster, since it doesn’t spin, and is integrated circuit with memory. For high availability, both AWS and Azure perform replication of your VM files to different zones. When you mistakenly damage your VM, this is quickly replicated. You can take snapshots as backup to recover damaged VMs for an extra fee. The snapshots are also stored on block storage, though AWS puts them on Amazon S3. Snapshots stored on Amazon S3 cannot be accessed via the Amazon S3 panel or Amazon S3 API. Snapshots are another area where Cloud Volumes ONTAP (formerly ONTAP Cloud) can provide an extra benefit using either cloud provider. ONTAP snapshots are more cost-effective and take less time to create since they only copy data that has changed rather than recreating the entire copy. On Azure, you can launch your own type of operating system that you have stored in a VHD file. Using Azure File storage, you upload the VHD to a Blob. Then, simply launch this as a VM. Warning! When you delete your VM in Azure, the original uploaded VHD file is deleted and becomes unrecoverable. Amazon, however, doesn’t allow you to launch from your own VHD, but you can develop with their many different OS offerings and save them as an image. Plus, when deleting a VM created from your own image, you don’t lose the image. You need to configure a VM to mount the Amazon EBS or Virtual Disks. Once attached to a VM you can setup NFS, SMB, iSCSI, fwiw, or CIFS to access the Virtual Disk externally. You cannot access them at all unless they are connected to a VM. Even if you need access to a tiny config file, the disk must first be mounted to some VM. To extend or shrink cloud block storage, you need to first detach the volumes. Amazon Linux automatically recognizes the new volume size; however, others usually need more work within the OS to be able to use the changed volume. Databases and local applications generally work faster on connected block storage. AWS even offers provisioned IOPS SSD for extra fast read and writes. On Azure, provisioning extra Virtual Disks gives you extra IOPS per disk. Pricing varies between regions, but we’ll look at prices for comparable areas of the US as an example. Amazon EBS: $.045 per GB for HDD, SDD $.10 per GB. Prices go up for greater IOPS. Free tier: get 30 GB SDD for free. Azure virtual disk: $.05 per GB for HDD. SSD are $19.71 for 128 GB per month. Azure also has a type of Virtual Disk called Azure Managed Disks, which is more flexible and more easily backed up than Amazon EBS or Azure Virtual Disks. Unlike the other options, you can change the volume size and available IOPs. You can also easily schedule a snapshot, though the snapshots aren’t incremental like Amazon EBS snapshots or Cloud Volumes ONTAP (formerly ONTAP Cloud) snapshots. Azure Managed Disks start at $19 a month for 128 GB offering 500 IOPs. When you think of cloud block storage, you should think of them the same way you think of a local drive on your physical computer. Regardless of which cloud you choose to work in, these allocations can be centrally managed through Cloud Volumes ONTAP (formerly ONTAP Cloud). Object cloud storage is another category of cloud storage for your data to consider in this AWS-Azure comparison. In general, it is data accessed and processed from an application. AWS object storage comes in the form of Amazon S3, or Simple Storage Service, and Azure object storage is available with Azure Blob Storage. Both Amazon S3 and Azure Blob Storage are massively scalable object storage services for unstructured data. Object storage has all the data stored together. Unlike block storage, you cannot change parts of the object. Managed object cloud storage allows you to expand your usage to as much data as you need. Not only that, but you can also store huge files. The largest Amazon S3 and Azure objects reach around 5 TB. You need to be well organized in your application design before you start such heavy moving. There are different approaches to getting your data to AWS. If your data is too big to send from your old data center to Amazon over the internet, you can physically ship it to them. This is a unique Amazon solution; after all, Amazon.com is still the world’s largest logistical shipper. Shipping parcels to them with petabytes of data is quicker than the fastest Direct Connect available. Amazon S3 storage is the 800-pound gorilla of cloud storage. It offers a lot of functionality, it has been around the longest, and many applications have been developed that use it. Cpanel comes with a backup solution to Amazon S3. You can’t natively mount Amazon S3 as a network drive, but Dropbox does just that and allows you to access Amazon S3 files from any device you can think of. Netflix also stores its video streaming service on Amazon S3. Amazon S3 has the added functionality that it is easily configured as a static website for any domain. Just assign the bucket name the same as the domain and point the Amazon DNS to it. Amazon S3 also has easy security, backup, and delete scheduling from the AWS Panel. Serverless apps using Lambda or Azure functions can draw the code from Amazon S3 or Azure storage. This allows for blurring the lines drawn by requiring block storage for VMs. By using Amazon S3 or blobs for your applications, you can save money and benefit from extensive APIs. Azure Blobs are only accessible through the Azure Portal or programmatically via API. You can write the program in any language you like. Azure has recently added Amazon S3 Api Proxy, so you can simply change your DNS to point to Azure with any application already designed to use Amazon S3. Azure has also added the ability to make html files stored in blobs to be static websites, also like Amazon S3. One advantage to using Cloud Volumes ONTAP (formerly ONTAP Cloud) with object storage is the data tiering ability, which tiers data that is infrequently accessed from highly-performant storage to less expensive object storage. This makes sure that you don’t overpay for storage for data that isn’t in constant use, while still making it available to you should you require it later. Amazon S3: Amazon S3 storage costs $0.023 per GB Per month through first 50 TB, then the price goes down. Prices are plus network usage. Free tier: gets 5 GB for free. Archive storage on Glacier is $0.004 per GB per month. Azure Blob Storage: Azure blob storage starts at $0.0184 per GB for hot storage but goes down to $0.01 per GB per month for cool storage, and $0.002 for archive. Both Amazon S3 and Azure Blob storage prices go up for greater redundancy. Other fun combinations of cloud storage are easily configured for common web applications. WordPress can store the PHP program on Amazon ECS, Amazon EBS, or an Azure Disk. You can use the common configuration of a local database or use any of the MYSQL compatible managed database services from AWS or Azure. WordPress can be set up to store all of its images on Amazon S3. Combining managed DB with offsite image storage greatly speeds up access to the WordPress site and can offer high availability through setting Amazon S3 to make the images available in all regions, bringing them closer to the client. This requires less compute power, so you can use a cheap Amazon EC2 or Azure VM to run the WordPress application. In the past you needed to plan for the future and purchase more storage to anticipate the application’s storage needs ahead of time, whether it was hard drives, NAS storage, or tape backup systems. Now, you can safely mount tons of data in the cloud without any initial investment or over-provisioning. Azure has an extremely easy-to-use service called Azure File Storage. From your Azure storage account, add a new file share. 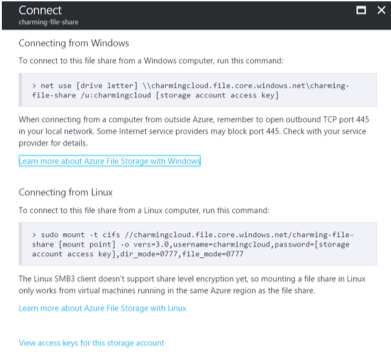 Select connect to get the Windows “Net Use” command, as well as the Linux “mount” command for Samba, since Azure File storage uses the SMB protocol for mapping. Then your new mount is available. You can store an unlimited number of files and are billed only for what you use. AWS provides a similar service in Amazon Elastic File System (Amazon EFS). You can mount Amazon EFS to Amazon EC2 servers. Amazon EFS uses NFS V4.0 /4.2 for mounting, but is presently only available in four AWS regions. You need a VPN or Direct Connect line to AWS to mount them on-premises, so Amazon EFS can’t be easily accessed. Many startups need a more integrated system than we have discussed. More mature cloud NAS storage solutions offer a console to manage not only your storage, but also your data which is spread across cloud providers, their data regions, and your own data center. This is where Cloud Volumes ONTAP (formerly ONTAP Cloud) comes in. Access data through standard protocols such as NFS and CIFS. Lift and shift data from existing NetApp storage systems to AWS or Azure through the use of SnapMirror® data replication. Use powerful storage efficiencies including thin provisioning, data deduplication, data compression, and thin provisioning to reduce the amount of consumed storage space, reducing cloud storage costs. Easily configure storage through the OnCommand Cloud Manager, which can monitor, analyze, and manage hybrid and multicloud storage systems from a single pane of glass. Amazon EFS: $0.30GB per month. Free tier: gets 5GB on sign-up. Azure File storage: $0.06 per GB per month for locally-redundant storage, though prices increase for more dispersed redundancy options. Cloud Volumes ONTAP (formerly ONTAP Cloud): Prices vary depending on the pricing plan that you choose. 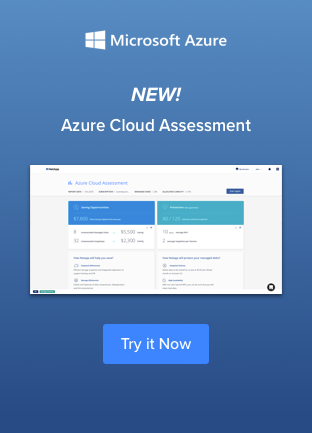 You can easily calculate your costs using our AWS calculator or Azure calculator. The sky's the limit in cloud storage, no matter who wins the AWS vs. Azure showdown. Take a few moments to think about your needs, then configure them. Just change the settings if you change your mind or make a mistake, since you are only billed for what you use. Startups have long held the reputation of being flexible and quick to evolve, whereas enterprises were all about moving slowly and taking a lot of time to change. The new scalability the cloud enables changes the nature of this perception. With Cloud Volumes ONTAP (formerly ONTAP Cloud) you get a solution that has worked for storage users for more than 25 years, now optimized for managing the highly diverse and dispersed storage formats available in the public cloud through AWS storage and Azure storage. To get more from AWS or Azure storage try Cloud Volumes ONTAP (formerly ONTAP Cloud) today with a 30-day free trial on AWS or a free 30-day trial on Azure.